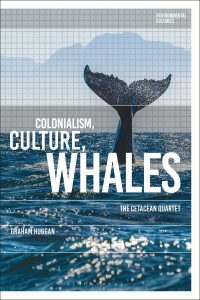 Graham Huggan answered a few questions for us about Colonialism, Culture, Whales, his new book in the Environmental Cultures series. Start reading Colonialism, Culture, Whales on Bloomsbury Collections. Colonialism, Culture, Whales looks at the transition from whale hunting (in the past) to whale watching (in the present), arguing that both are part of a continuum of colonial practices involving the human exploitation of animals. I am a ‘postcolonialist’ by training, but have become increasingly interested in how colonial practices, values and attitudes continue to play into human relationships with nonhuman environments and creatures. And, like many people, I have an enduring fascination with whales! The research took a couple of years, though some of the formative ideas have been around for considerably longer. Most of what I’ve said has been said elsewhere, but the book’s interdisciplinary approach is quite new, as its philosophical focus on the figure of the ‘melancholy whale’. I’m not sure I see the book as belonging to ‘literary studies’; ‘cultural studies’ might be more appropriate. Even better would be ‘environmental humanities’, a rapidly emerging field that combines critical insights drawn from the sciences as well as the arts. Unsurprisingly I’m keen on Margret Grebowicz’s Whale Song, with which my own book shares several insights. I’m keen in general on Bloomsbury’s Object Lessons series, to which Grebowicz’s book belongs. I also like the Environmental Cultures series, with which my own book is aligned and to which I’m very happy to contribute. Both series are academic, but in their own way, and make some attempt to reach out to non-academic readers. Graham Huggan is Professor and Chair of Commonwealth and Postcolonial Literatures at the University of Leeds, UK. A leading postcolonial critic, he is the author of 13 books, including Postcolonial Ecocriticism: Literature, Animals, Environment (2010) and Nature’s Saviours: Celebrity Conservationists in the Television Age (2013). His new book, Colonialism, Culture, Whales, is now available from Bloomsbury.